SCVHistory.com | Saugus | United Airliner Forced Down in Saugus, 12-30-1964. United Airliner Forced Down in Saugus. Piloting skills credited for lack of injuries to 47 on board. United Air Lines Convair 340, registration N73102, was on a scheduled flight from Fresno to Los Angeles when it made a forced "dead stick" landing in Saugus, just a couple of miles from my home. It was about 11 a.m. on Wednesday, Dec. 30, 1964. United scheduled the aircraft to fly nonstop from Fresno Air Terminal (FAT) to Los Angeles International Airport (LAX), a distance of 209 statue miles, 181 nautical miles. While en route, flying over the town of Saugus in the Santa Clarita Valley, both engines stopped. The flight was under the command of United Captain Wade. He had encountered trouble with one of the engines priort to takeoff in Fresno. A problem with the electric fuel pump prevented it from starting. With only one engine running, Wade obtained fuel pressure to start the other engine by using fuel "cross feed." Cross-feed is the ability on multi-engine airplanes to use a working engine's fuel pump to provide fudl to another engine. Both engines receive fuel from one tank, with fuel pressure created by either the good engine's mechanical fuel pump or the electric fuel pump. Two issues now coalesced into the sequence of events that led to the forced landing. One issue was incorrect instructions in the airplane's flight, maintenance and training manuals. Prior to this event it was thought that a check valve was in the system when fuel cross-feed was on, to prevent pumping fuel out of the tank feeding the good engine into the fuel tank of the other engine. 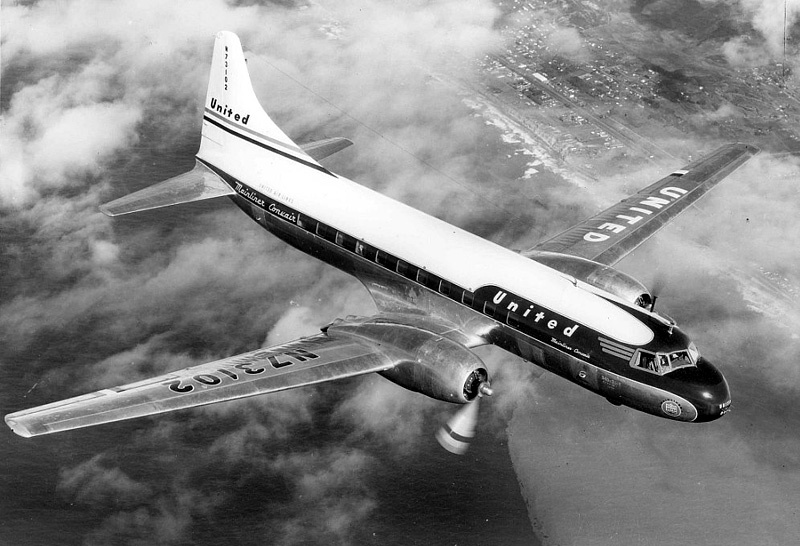 It turns out, that wasn’t accurate on the Convair 340 at the time. John Wade, Captain Wade's son, provides this information: "He was operating the cross-feed system in line as they were trained. Both training and maintenance erroneously thought that the Convair, like the DC-6, had a check valve that prevented transferring fuel from tank to tank. Even the flight manual at the time was wrong. Dad essentially got led into a trap." Once the engine with the faulty electric fuel pump began running, its mechanically driven fuel pump would begin providing fuel pressure to it. At this time the cross-feed could be turned off. Enter the second issue: Captain Wade didn’t turn off the cross-feed. On other aircraft Wade flew, it wouldn’t make a difference if cross-feed was on; the check valve would prevent fuel from the tank with the good pump from being pumped into the other fuel tank. The United flight departed Fresno and climbed out over the San Joaquin Valley and the Tehachapi mountains without incident. As it arrived over the Santa Clarita Valley, Wade found the area cloudy with a low overcast. Below the overcast it was either misty or raining. Then both engines stopped. The cause of both engines stopping was fuel starvation, not engine failure. John Wade reports: "At the time the airplane was flying under IFR (instrument flight rules). ATC (air traffic control) initially misidentified him on radar." Bear in mind that this occurred in 1964, when radar had much less capability than today. Typically radar contact (identification) occurred when the airplane made turns, so the radar operator could identify it. "Misidentification occurred," John Wade continues, "and the heading given by ATC was taking the United airplane directly into mountains. Captain Wade had the situational awareness not to take the first heading they gave him. Good thing, as he would have hit a mountain while still in the clouds." "He popped out of the clouds in a valley, did a 180-degree turn to line up with the field on short final" (the last heading before landing), John Wade said. One source indicates the captain had to fly under some power lines to land; another source indicates it wasn’t necessary. "Captain Wade made a partial flap, gear up landing. He did an excellent job of making a dead-stick landing. None of the 43 passengers or four crew members was hurt." "On a humorous note," John Wade said, "after they deplaned, an elderly woman asked Dad if this meant she would miss her connection in LAX." Local television reporters interviewed passengers, all of whom gave thanks to Wade’s skills as a pilot. Jim Mosley, son of the manager of the Newhall Ranch, witnessed the forced landing. "The field was very muddy, and (his father) hooked up a caterpillar to a flatbed trailer and brought all the passengers to (our) home so they didn’t have to wade through ankle-deep mud." Mosley reports that United Air Lines bought them a new carpet afterward, so terrible was the mud. 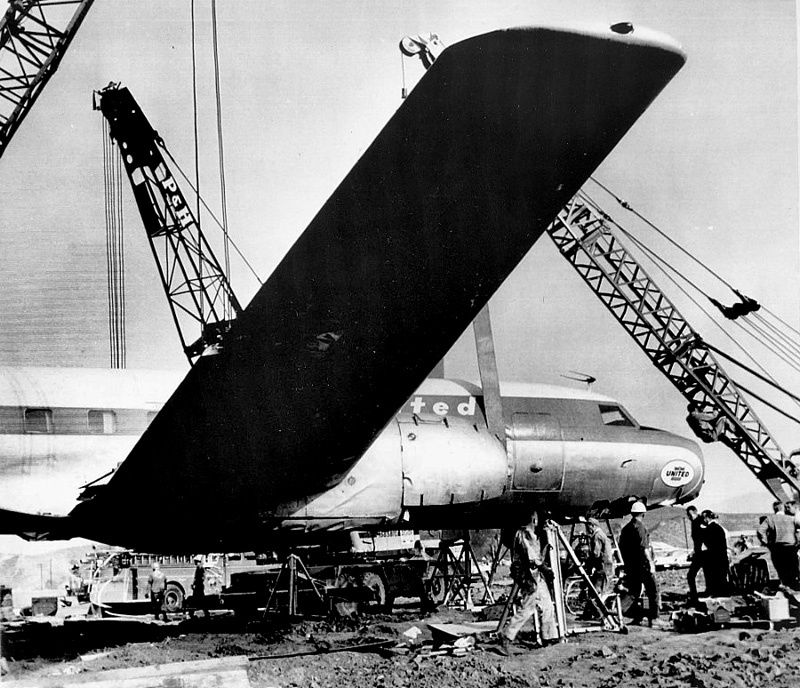 United mechanics from Los Angeles hoisted the airplane, lowered the landing gear, replaced the propellers and some other parts. Another United pilot made the take off from the Saugus onion field and flew the airplane gear-down to San Francisco for an in-depth mechanical analysis of the ship. Mosley also witnessed the takeoff, "which although a shorter runway than normal, did clear the power lines by a good margin." In conclusion, Captain Wade showed considerable airmanship in a fine off-airport, dead-stick landing — especially so because there were no injuries to passengers or crew. The passenger who asked if she would miss her connection at LAX gives a good indication that the passengers felt he did an excellent job. Postscript: There is some question whether the forced landing occurred in a beet field, carrot field or onion field. Regardless of the crop, today the field no longer exists. Houses occupy the fields where vegetables once grew. 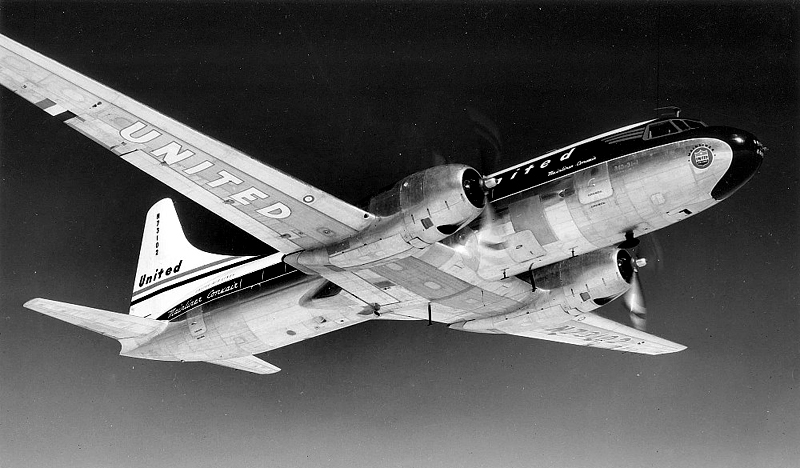 N73102 went on to fly with United until 1966 when it was sold to Frontier Airlines, which converted it to a model 580 turbo prop. It is still flying today for Honeywell International, which registered it as N580HW. It is listed as "experimental," suggesting it is used for development work. Larry Westin lived in Saugus until 2000 and now (2012) resides in central Maine. __ A retired American Air Lines pilot who knew Captain Wade (name unknown), who provided the author with information. __ Various local television reports of the incident. Mosley, Jim. Son of the then-manager of the Newhall Ranch. E-mails to the author. National Transportation Safety Board incident report. Wade, John. Son of United Air Lines Captain Wade. E-mails to the author.